LAS VEGAS – May 10, 2016 – Shelby American, a wholly owned subsidiary of Carroll Shelby International Inc. (CSBI:PK) is continuing its global expansion by introducing its first international turnkey small block racing Cobra. The “Sebring Tribute” limited edition Cobra roadsters will go into production during the second quarter of 2016. The lightweight roadsters will come complete with a genuine 289 c.i.d. aluminum engine and Ford transmission. Available in aluminum or fiberglass, the 15 total track cars will have a Shelby M.S.O. and be sold worldwide. 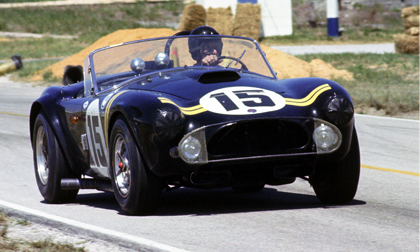 Soon after Shelby American introduced the first small block street car in 1962, the company began work on a racing version of the car. Powered by Ford and fueled by the dreams and hot-rodding talent of Carroll Shelby and Shelby American, the Cobras were a terror on the track winning the US Road Racing Championship in 1963. The 289 Shelby Cobras were also part of the Shelby American team that won the 1965 FIA World Sportscar Championship, which is still the only American team in history to win that prestigious title. CSX2128 raced as a Shelby American factory team car from March through July. Sold to Coventry Motors, the cars’ success during the remainder of 1963, prompted Shelby American to buy it back for the 1964 season. This “workhorse” was among the most successful of the factory team Cobras and its illustrious history included an intersection with Hollywood. While driven by Allen Grant for Coventry Motors, a new livery for the car was designed by eventual movie titan George Lucas. The Sebring Tribute edition cars are based on the Shelby American CSX7000 Continuation Shelby Cobra. The Shelby Sebring Tribute Cobras will retain the authentic style suspension and masculine body lines, but are upgraded to contemporary standards. Shelby American uses modern disc brakes, a stronger frame and the bodies are available in either aluminum or fiberglass. Just like the 1960s race car, the series will features widened front and rear fenders, cut-back doors, more aggressive dampers, racing wheels featuring the pin-drive hub, oil cooler scoops and a 289 small block engine. Each car will be built to order and delivered with a Shelby American serial number for documentation in the official Shelby American Worldwide Registry. Pricing and final specifications for the Sebring Tribute Edition Cobra will be announced soon. Orders will be accepted at the end of the second quarter with delivery expected at the end of the year. For more information on the complete line of Shelby vehicles, visit www.shelby.com.